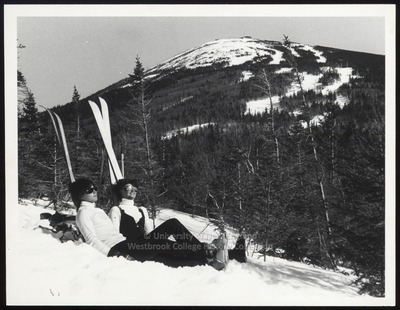 "Two Skiers Relaxing in the Sun, Westbrook College, 1970s"
Two Westbrook College students relax in the sun, by leaning against their skis which are stuck upright in the snow forming lounge chair backs, in this 1970s candid black and white photo. The two young women wear white turtle neck jerseys and dark ski pants with ski boots and gloves. Large dark glasses protect their eyes from the bright sun's glare. Their short, dark hair styles are uncovered, and casual and tousled. The mountain's white ski trails and dark evergreen trees form the background against which the two students appear to be the only skiers anywhere in sight. Have they chosen the mountains for spring break while everyone else has chosen to flee to a warmer climate?